Elite is a top quality turf providing a superb finish for ornamental lawns. It will add the finishing touch to the landscaping in any prestige housing development. Sovereign New Century was developed over many years to provide a first class surface for golf and bowling greens. Ideal for professional green keepers. Achieve a stunning lawn overnight with this Premium Grade Turf. We provide Regal Turf. Convenience, efficiency and quality are its hallmarks. A stunning, fully formed lawn can be installed in hours at a surprisingly low cost. As well as being the best choice for winter sports pitches, playing fields and golf courses, the Pro Sports Turf is an excellent option for parks and gardens, especially those which expect a high footfall on their lawns. Xeris Turf is designed to need less moisture and withstand dry conditions. Its blend is the future of lawns for those faced with water scarcity situations. If for any reason you need to cancel a turf order, we will need a minimum 48 hours’ notice, prior to the delivery date. Once turf is cut and loaded for delivery, if the order is cancelled or returned due to no fault of Collier Turf Care then the costs incurred will be passed on to the customer. We recommend turf is laid within 24 hours of delivery, ideally on the same day. It is the customers responsibility to advice Collier Turf Care of any access issues. Please make sure there is a hard standing area for the turf to be delivered onto, which the delivery vehicle can access. Once laid, irrigate daily until the roots have moved out of the turf into the soil. 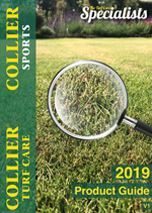 For information on the on-going maintenance of your lawn please contact Collier Turf Care or look under the technical section on this web site.